He followed his personal journey with epidemiology, biological causes, and historical development of depression. One subject that I found particularly interesting was when he discussed children of depressed mothers. Solomon claimed that such children are sadder, have lower IQ, more anxiety, and poor social skills. He said that it is often more beneficial to the child to treat the mother instead of the child. Solomon made me cringe when he suggested that people who talk about suicide are more likely to commit suicide; therefore, crisis hotlines may actually be promoting suicide rather than preventing it. I’d rather not believe this, since I volunteer for a suicide hotline, though this information does match what Butcher’s Abnormal Psychology textbook claims in chapter 7: that research shows no evidence that crisis hotlines reduce the rate of suicide. However, I’m going to stubbornly continue my work at the crisis hotline, because I can’t possibly think that I’m doing any harm. And I know that most of the people I talk to feel better after the conversation. Solomon shared a story about a suicidal octopus who was a retired circus performer. Apparently, this octopus kept trying to do its tricks, but was no longer receiving positive reinforcement. The octopus began to fade in color (a sign of stress) and stopped eating. After several months it performed its tricks one last time and then pecked itself to death. Although this was a moving anecdote suggesting that depression can occur in animals as well, I find it a little fishy. After all, anyone who was paying such close attention to the octopus to notice its change of color, appetite loss, and melodramatic last-show would certainly have tried to alleviate the octopus’ suffering. 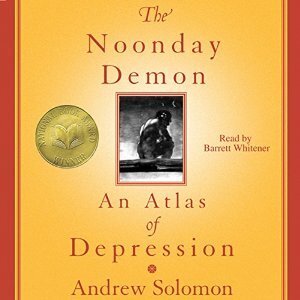 Solomon’s history of depression was also quite fascinating. He pointed out that in the late 16th century it was in vogue to be melancholic, and that people would pretend to be depressed – loafing around on couches and saying melodramatic things – in order to appear intellectual. Solomon suggested that depression might have evolved in hunter-gatherers in order to promote an appropriate social hierarchy. That early humans became depressed because they were at the bottom of the hierarchy – or after they had challenged the leader and lost. This depression helped them to stay where they belonged in the hierarchy and to discourage them from re-challenging the leader. Depression may have had an evolutionary advantage at one time, but it has now lost that purpose. It now manifests for other, less suitable, reasons. Solomon suggests that one reason it is so prevalent these days is our increased choices. Hunter-gatherers didn’t have to stand in a grocery store looking at all the different types of food to eat. They ate whatever came their way. They didn’t have an uncountable number of potential mates, they had only a few. Thus they weren’t plagued by the notion that they may have chosen the wrongly. Although the hierarchy-stress hypothesis fits well with Robert Sapolsky’s findings about baboons (I’m currently listening to a set of lectures by Sapolsky and will review soon), I feel a little bit of skepticism about the choice hypothesis. I think there are a lot of reasons we experience stress – choice might be one of them, but it’s not the main factor. I found this book fascinating. Solomon did a great job of inserting little vignettes of his own story or stories of people he interviewed into his more intellectual portions of the book, so that the material never became dry despite its length. Solomon came up with so many interesting points that I was always interested in what he would say next. His own story was touching. His facts seemed very well-researched. In short, it was simply an amazing book. and generally good writing style. i loved this review! This is on my to be read list. Your review has convinced me to pick it back up. Fantastic review! I have this waiting for me at the library– he'll be speaking here in Pittsburgh in a few weeks. And definitely continue your work at the hotline. I'm convinced it makes a difference. Yeah, I know right? I want to believe it's not true because it made little tears in my eyes as I was listening to that part.